Presented here, simply the best mocha mug we have had the pleasure to present. It is HUGE! it stands 5-3/4" tall and is 4-1/4" in diameter. It is larger than a quart mug as it holds 5 cups. The decoration is Earthworm, Catseye, and Dots. Notice how the dots encircle the Catseye closest to the handle forming a flower. There is an identical one on the other side of the handle also. The extruded handle has nicely formed foliate terminals. Big, Bold and Gutsy . . . They just don't get any better than this! Now for the best part, and I love to say this . . . there are absolutely NO condition issues or stains on this piece. The colors are gorgeous! It is as perfect as the day it was made. 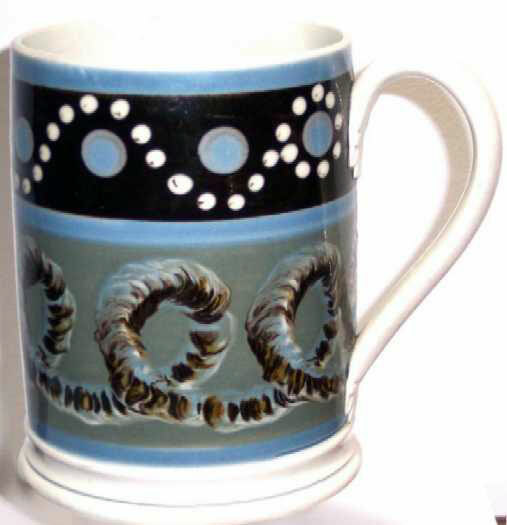 A stellar addition to any serious mocha collection, c. 1830's.